Nick Schultz | The Phoenix Loyola's first sellout of the year came Nov. 9 against Furman. Feb. 24, 2018, Loyola head coach Porter Moser’s dream of a sold-out Gentile Arena came true for the first time. Nearly a year later, the arena has sold out three times and will be full at least one more time this season Jan. 27 — meaning coaches have to get creative when calling plays in such a raucous environment. This season, Loyola has sold out three games — against Furman University Nov. 9, against University of Nevada Nov. 27 and, most recently, against Illinois State University Jan. 12. 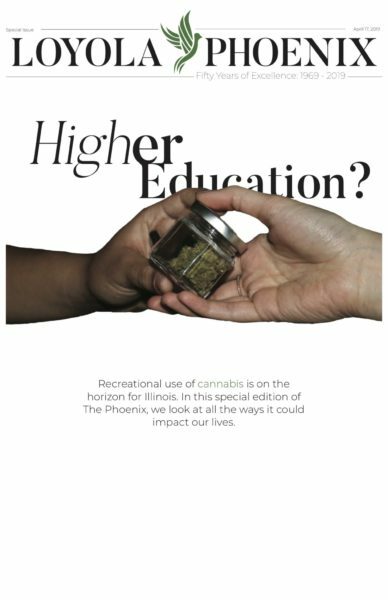 The Ramblers’ tilt against Southern Illinois University (SIU) at the end of the month is also sold out, The Phoenix reported, and their game against Missouri State University Feb. 17 had 39 tickets remaining as of publication. The uptick in attendance comes amid a newfound optimism from fans and students, as season ticket sales and student interest have both increased since Loyola’s NCAA Tournament run last year. 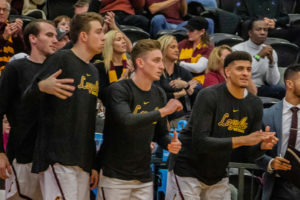 Loyola also played in front of a crowd of more than 68,000 during its Final Four loss to University of Michigan last year at The Alamodome in San Antonio — the equivalent of 13 Gentile Arenas. Gentile’s the smallest arena in the Missouri Valley Conference (MVC) with a capacity of 4,963, but Moser waited seven years to enjoy a capacity crowd during a game. 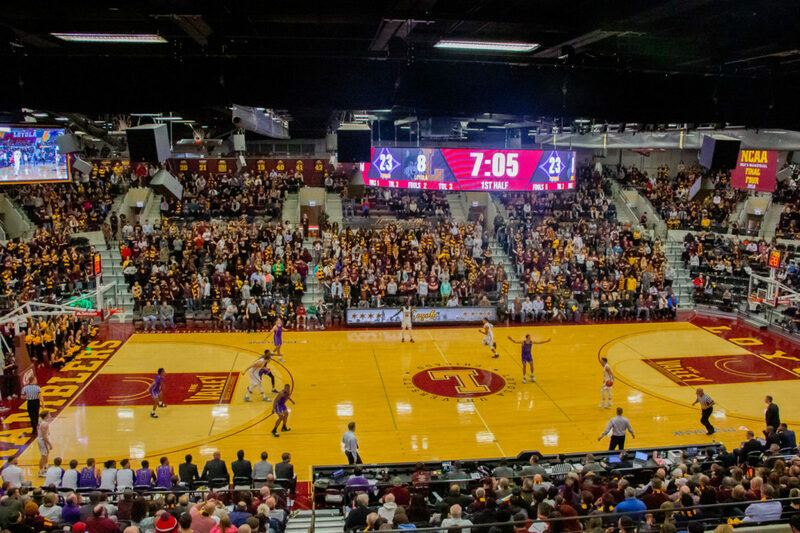 It creates a fun atmosphere for Rambler fans and students and gives Loyola a home-court advantage. But other MVC coaches don’t mind traveling to such a raucous atmosphere despite the challenges of being the visiting team. When the 45,000-square foot fills up, the sound of the crowd bounces off the concrete walls, which creates problems for both teams when they try to call plays. SIU head coach Barry Hinson said finding ways to convey the play calls is crucial in every arena he coaches in, but he said he still prefers the louder atmospheres because they’re more fun to be around. Illinois State has played in two of the recent sellouts in Rogers Park. Illinois State’s home court, Redbird Arena, holds 10,200 fans and last sold out in 2010. Even though Gentile’s smaller and more intimate, head coach Dan Muller said bigger crowds aren’t only great for the teams playing in the game, but also for the MVC as a whole. SIU, however, will face its first Gentile sellout crowd Jan. 27. SIU Arena, which holds 8,339 fans, hasn’t been sold out since 2016 when 8,284 fans came out for a game against Wichita State University. The Salukis have played in front of other big crowds this year, though. More than 20,000 people watched them fall to University of Kentucky 71-59 on the road Nov. 9, just short of Rupp Arena’s capacity of 23,000. Hinson said although his team fell short at Kentucky, he said it proved the Salukis can handle playing in a loud arena. After traveling to Indiana State University and Missouri State Jan. 19-23, Loyola is set to square off against SIU Jan. 27. Tip-off is scheduled for 3 p.m. and the game will be broadcast on ESPNU.